SunEdison got a reprieve from a potentially disastrous cash crunch this week. SunEdison Inc (NASDAQOTH:SUNEQ) got the lifeline it needed from a courtroom in Delaware on Thursday. The company defeated billionaire David Tepper's -- who holds about a 9.3% stake in TerraForm Power (NASDAQ:TERP) -- effort to block TerraForm Power buying Vivint Solar (NYSE:VSLR) assets as part of SunEdison's takeover of the residential solar company. TerraForm is scheduled to buy 523 MW of operating assets for $799 million and without that money the deal was in question and, in an extremely-but-possible outcome, SunEdison could have even been forced into bankruptcy. The news was a relief for SunEdison and sent its shares higher Friday, along with Vivint Solar. While this is a short-term reprieve, it may not solve all of the company's problems long-term. What Tepper's lawsuit was trying to do was get an injunction on TerraForm Power buying Vivint Solar assets. He felt that buying residential solar assets was higher risk than TerraForm's original business model of buying large-scale wind and solar assets with long-term contracts to sell energy to utilities. Clearly, the court disagreed that the acquisition was inappropriate and it's now likely to lead to a completed deal in the next few weeks. Tepper says that he'll explore further options he has after reviewing the ruling, but this looks like a saving grace for SunEdison at the moment. If the transaction between Vivint Solar and TerraForm Power had been blocked, it could have led to a cascading cash crunch for SunEdison. In early January, SunEdison gave a presentation to investors outlining its 2016 plans and included the cash walk chart below. The assumptions include, TerraForm buying $799 million of Vivint Solar assets and $550 million in new loans associated with the acquisition, partially from Vivint Solar's majority owner Blackstone. If TerraForm Power didn't acquire the assets it had agreed to, it could have blown a $1 billion-plus hole in the balance sheet, something SunEdison couldn't handle at the moment. Image source: SunEdison investor presentation. Now, as management sees it, the company should have $1.3 billion in cash at the end of the year, even after financing operations. This assumes projects will be completed and sold on-time, which we could probably call into question, but there's now time to show that project execution will live up to plan. Short-term, the ruling against Tepper gives SunEdison some leeway. It doesn't have to find $800 million to complete the Vivint Solar acquisition or find a way to wiggle out of it. But long-term the company's challenges are the same. Debt is piling up and losses are mounting. One of the assumptions management laid out in its January presentation is that it would be able to sell projects to third parties for a 17% gross margin. That would put SunEdison among the highest margin developers in the renewables market, something it has never demonstrated the ability to execute on. There's also the fact that financing markets have slowed dramatically for renewable energy projects as of late, so willing buyers may be few and far between. 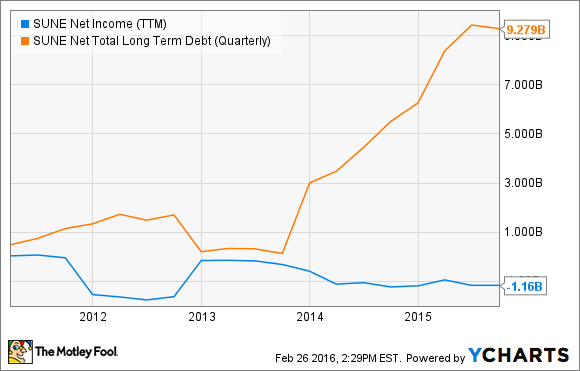 Then there's SunEdison's own debt costs. It recently refinanced some debt at the incredibly high interest rate of LIBOR + 10%, with an 11% floor. This compares to competitor SunPower, who recently said its revolver capacity was at LIBOR plus 1.5%-2% and First Solar who has a revolver for LIBOR + 2.25%. Long-term, SunEdison can't compete in the renewable energy markets with higher financing costs than competitors and that's the biggest concern long-term given the company's debt load. A short-term win with long-term costs? What's strange about the excitement in acquiring Vivint Solar is that it does nothing to lower SunEdison's borrowing costs or its operating costs. If fact, operating costs will only go up with the new subsidiary and that puts further pressure on executing operationally. I think the deck is still stacked against SunEdison, although it has a longer runway now than it might have a week ago. Now, investors' focus will turn from the courtroom to earnings reports. And that's what SunEdison will really show if these transactions are going to make the company stronger or weaker long-term.